The history of an era is best told by the people who lived it. 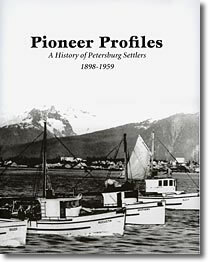 Pioneer Profiles: A History of Petersburg Settlers records the courage it took for immigrants to travel to America from their native lands. Unfamiliar with the language, they struggled to build homes, raise families and live off the land in the harsh Alaskan wilderness. It has been more than a century since the founding of Petersburg on the shores of Alaska's Mitkof Island. Petersburg's proximity to the sea — and the beauty of the surrounding mountains — has endeared it to generations of families, many of whom still call it home. Don't have Acrobat Reader? Download it from Adobe's site. Copyright © 2001-2004 Sandy Hershelman. All rights reserved.